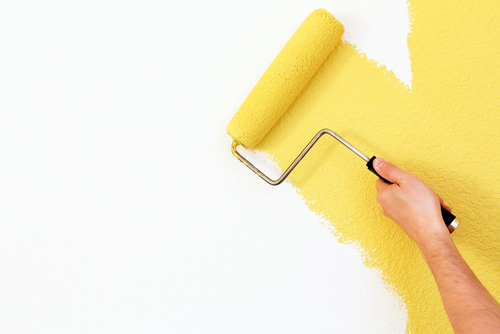 Most of us would like to think that we could decently paint a room, right? How hard can it be? Pick a color, slap it on the wall, and you're good...right? Well, there's a bit more to it than that. In fact, we would argue that there's an art to painting. And just like most things, if you take your time and follow the proper instructions, the outcome will be better for it. But what if you don't know the secrets to making a painted room look professional? Then you've come to right spot. We'll fill you in on everything you need to know before you start taping. Step 1 is to take everything out of the room you're painting. And we really mean everything - doors, light fixtures, hardware, etc. (Large pieces of furniture can stay in the middle of the room if they are covered.) Put down high-quality drop cloths, ones with canvas or paper-backed plastic. Old sheets are not sufficient, as paint soaks right through. Before you start painting, you need to create a smooth surface to paint over. If you have minor cracks or dents, use a lightweight putty to fill them in. (If they are larger than 1/8 of an inch, use plaster of Paris instead.) Smooth any of the repairs with a sander. Unless you want textured walls, you'll need to remove the dust from the sander before continuing. (You can wash the walls with a mild cleaner.) Once the surface is dry, you can add the tape. Painter's blue tape is usually easier to remove than regular masking tape. Now that your room is prepped, you can pick what's going to go on it. The pros start with an alcohol-based primer which establishes a solid, even base and seals stains. You also want to purchase quality paint, which sadly doesn't come cheap. (You'll likely spend $20-$35 per gallon for a good quality paint.) In general, glossier paints are more stain resistant and scrubbable. But a higher sheen will highlight any imperfections. Plan to paint two coats, which makes for the nicest finish, and save at least 1/4 gallon for touch ups in the future. You can have the best paint in the world, but if you don't use the right equipment, your job won't turn out as well. Thankfully, you don't have to opt for the most expensive roller. If you do buy a cheap one, wash it in dish soap before you use it to remove any stray fibers. 9 inch rollers are lighter and easier to use than 18 inch ones, which also tend to create more texture. You also might consider using a painter's rod, which will help you paint the ceiling without bothering with ladders or stepstools. Just don't stand directly under the area you're painting; otherwise, you might get some excess splatter. Investing in a good brush is also a must. High quality brushes can cost $20, but they are worth the investment. When choosing a brush, pay attention to the bristles. Tapered ones can help you get into corners and cut a line. There are obviously different sizes of brushes. Pros keep an arsenal on hand. A 2-inch brush can help you get started but keep in mind that you wouldn't want to paint a whole room with it. Ideally, you want as much paint on the brush as you can control without making drips or blobs. Instead of wiping your brush against the side of the paint can, consider tapping both sides instead which removes the excess and forces the paint onto the bristles. After painting the ceiling, you'll want to work from the top down (from the crown molding down to the floor). The best time of day to do the windows is the morning while you're still fresh. Lay down doors on sawhorses to paint horizontally so that your paint doesn't run. If you're doing a two-day job, don't bother washing your brushes. Wrap them in a grocery sack and put them in the refrigerator. Painting requires patience, but the effects of a freshly-painted room are well worth the effort. Not sure if you're up for the challenge? You can always hire the job out. Or follow our tips and let us know how your room turns out!